Last week, I had the pleasure of visiting Ogden, Utah, the home of the western distribution center of Quality Bicycle Products. QBP is the big-daddy/big-momma company of both Salsa Cycles and Surly Bikes, among other brands, as well as a distributor for a host of other well-known bicycling products. 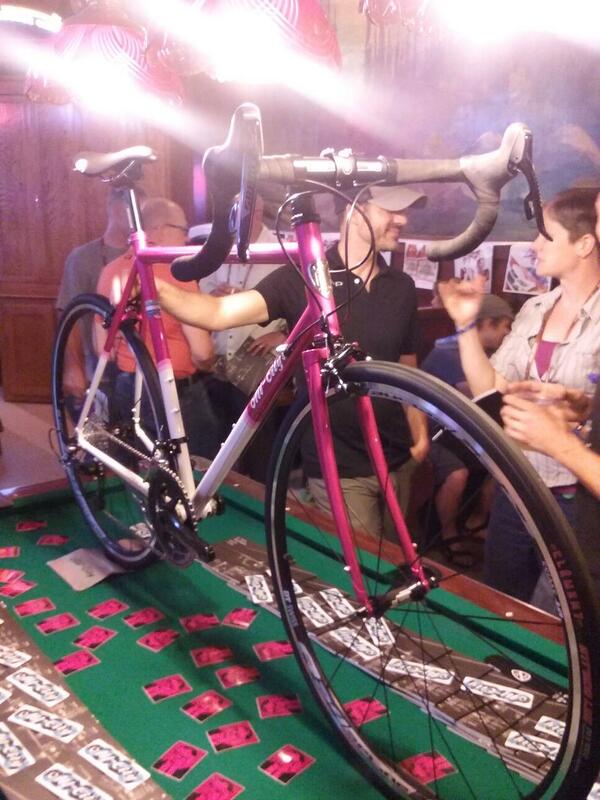 Every July, QBP hosts their top dealers (like us here at Century Cycles) at an event called SaddleDrive. 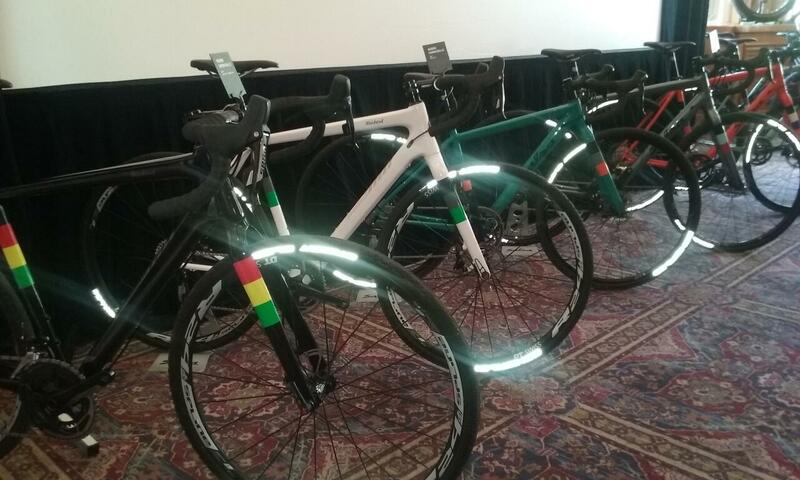 In addition to meetings, warehouse tours, and great food, the highlight of the trip is that we attendees get to test-ride the latest and greatest bikes from QBP brands. 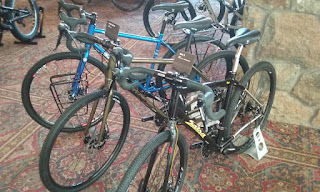 All-City has a fine selection of steel road, cyclocross, touring, and track bikes. 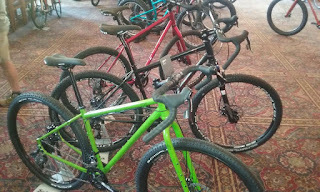 We don't carry them in stock, but check them out at allcitycycles.com, and if you see something you like, we can special-order it for you. Hanging out at the party was Jay Petervary, the Salsa-sponsored ultra-endurance bike racer, best known as the winner and previous record holder of a few past Tour Divide races. 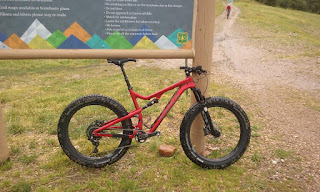 This is the new Salsa Cutthroat bike that they announced last month. 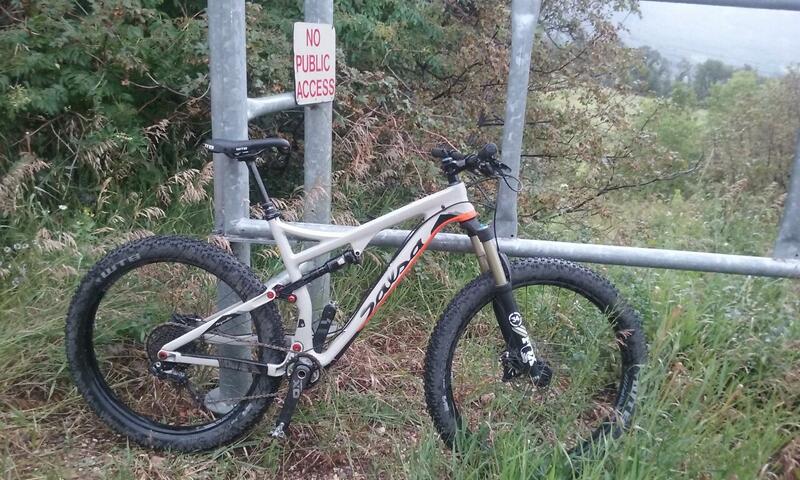 Like its uncle the Salsa Fargo, it's a drop-bar mountain bike designed for off-road touring. But, it's got an all-carbon frame and fork, and different geometry, with a shorter wheelbase built for speed and handling, and bigger frame pack hauling capacity. 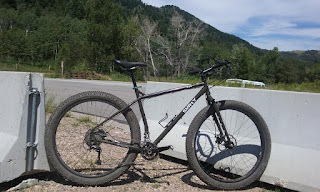 I got the chance to ride the Cutthroat on the test track, which was a combination of gravel road and singletrack of about one mile. 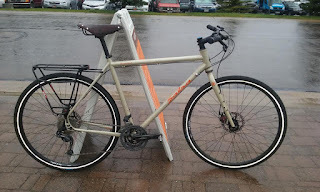 Like my own Fargo, it felt comfortable and stable at both high and low speeds. 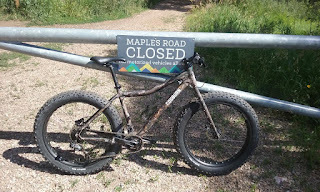 It was a bit harsh, as you'd expect of any rigid mountain bike, but the light weight made it a quick climber, and it handled the twisty singletrack like a true mountain bike should. If you're looking for a mountain bike that can do double-duty as a lightweight gravel racer, this bike would fit the bill. 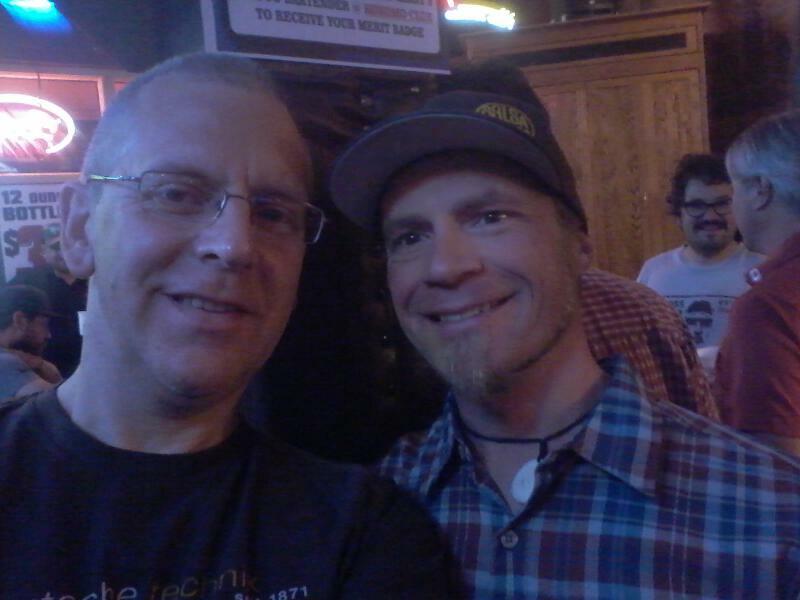 When I attended SaddleDrive back in 2013, it was 100 degrees with what felt like 0% humidity. The last thing I thought I'd need when I packed this year was a rain jacket (or anything with long sleeves, for that matter). But, much to our surprise, Monday morning we woke up to a light drizzle, which continued in the demo area up in the mountains. This gave us a good opportunity for test-riding bikes in more typical Ohio conditions, though! 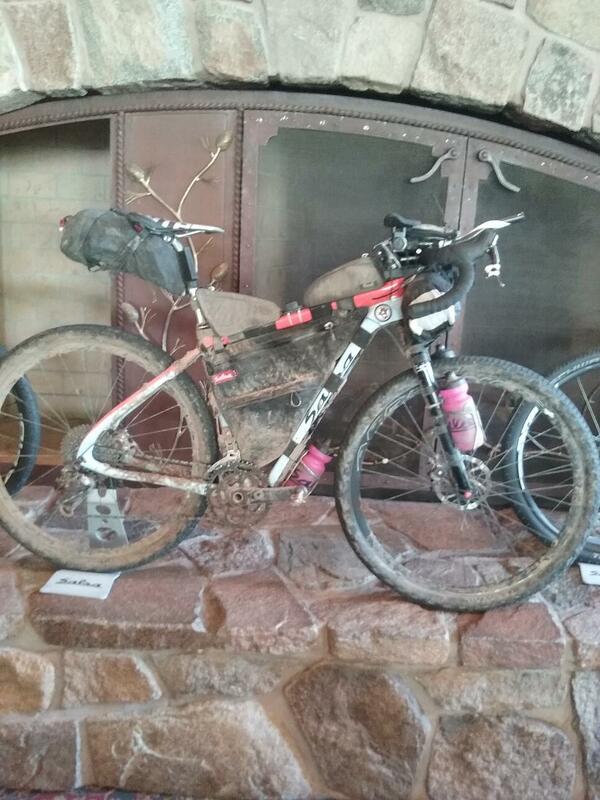 The Pony Rustler will be available in two carbon and one aluminum option. And here's a little secret: the 2016 Horsethief Carbon X01 and the 2016 Pony Rustler Carbon X01 are identical in frame and parts spec. 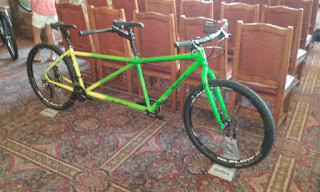 So, get one bike, get a second set of wheels, and you've got the capability to switch from a regular 29er bike to a 27.5+ bike. 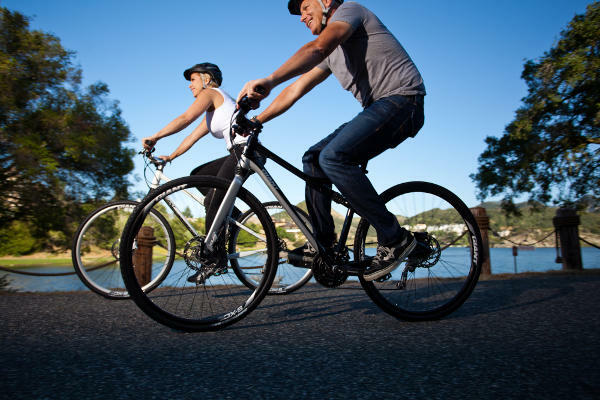 Both bikes feature the new Boost hub spacing front and rear, which gives you extra clearance for those wide tires. So, what's the verdict on the 27.5+ platform? All I can say is WOW. The "plus" size tires give you the dirt-eating traction of a fat bike, with the reduced weight and maneuverability of a traditional tire. Of course, Salsa's exclusive Split Pivot suspension eats up the rocks and roots and keeps everything under control. I see a 27.5+ bike in my future. 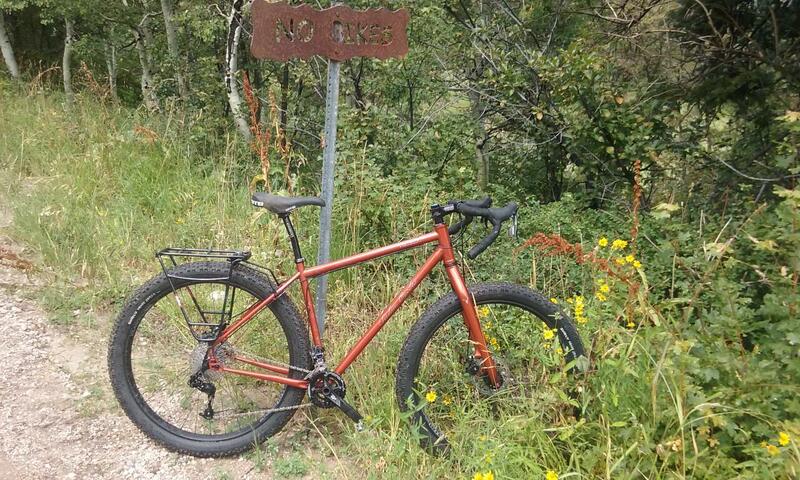 Call this bike a quiver-killer--the carbon frame option gives you the light weight of a traditional mountain bike, and the fat tires give you your winter snow-riding ability, so pick the Bucksaw if you want one bike to rip year-round. It's also available in two different build options with an aluminum frame. The Deadwood features a steel frame with Boost rear hub spacing, and carbon fork with 100mm thru-axle. As a Fargo fan and new plus-tire fan, of course I was impressed. 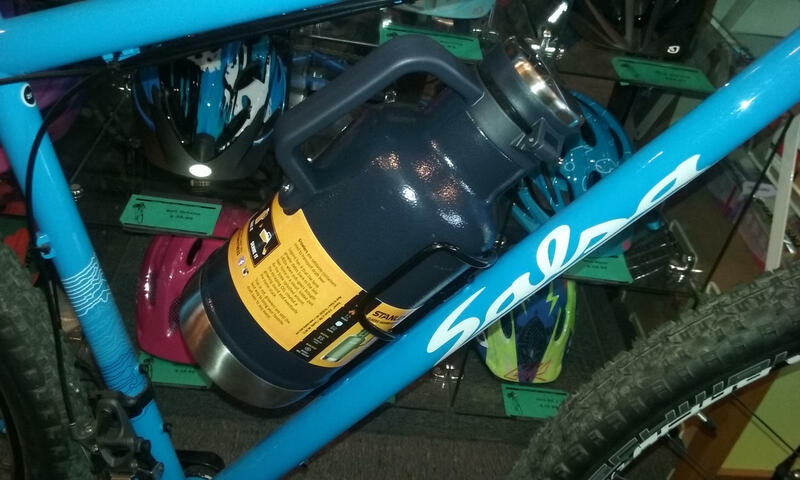 Rack it up, load it up, and disappear for weeks or months on your favorite road or trail. 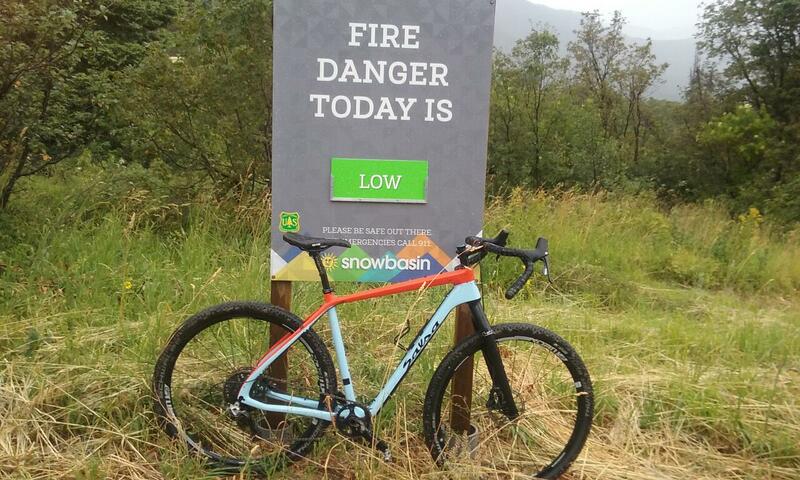 This will be Salsa's "very limited edition" bike for 2016, so if you want one, give us your money NOW. 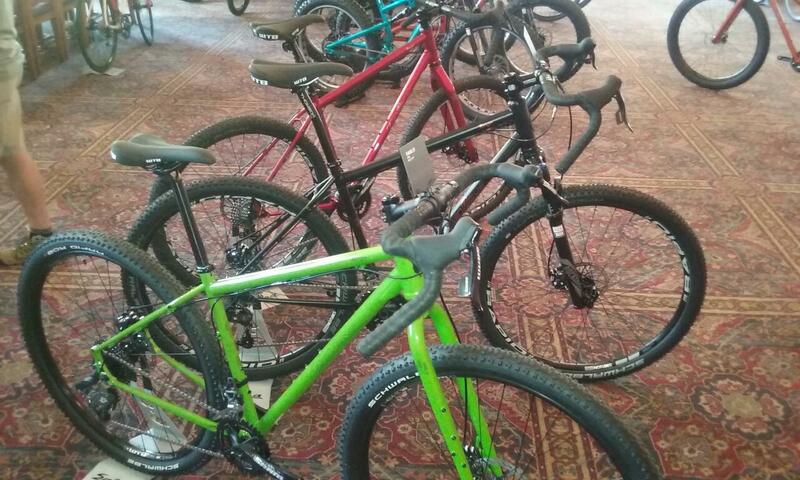 Big changes are afoot in Salsa's touring bike lineup for 2016. 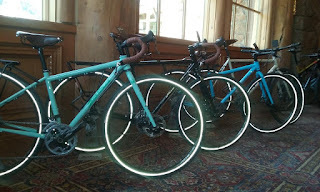 The Vaya touring bike popular in 2014 and 2015 has moved migrated to becoming less of a pure touring bike and more of a "light touring," gravel-road, adventure bike. Gone are the triple cranksets, in favor of compact doubles. All sizes now have 700C wheels. It will be available in a model with titanium frame, carbon fork, and SRAM X0/X9 2.10 drive train, and two steel frame/fork models, one with SRAM X9/X7 2x10 drive train, and Shimano Sora/Deore 2x9 drive train. The drop-bar Marrakesh will be available in Green or Black, and the flat-bar version will be available in Blue or Cream. 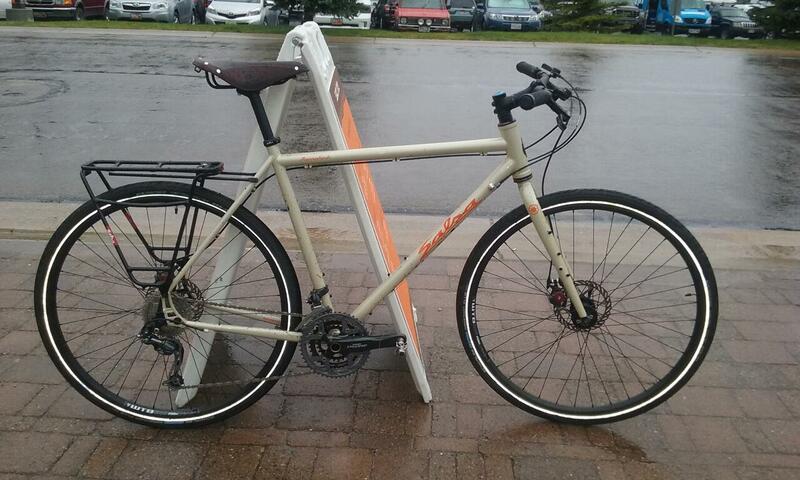 Like the original Vaya, both bikes feature Avid BB7 disc brakes and Schwalbe Marathon Plus tires. The drive train is Shimano Deore 3x10 with Microshift thumb shifters, for durability and easy serviceability on the road less traveled. Most interesting, the Marrakesh bikes will all come with the Salsa Alternator rear rack pre-installed, plus a Brooks B-17 saddle! 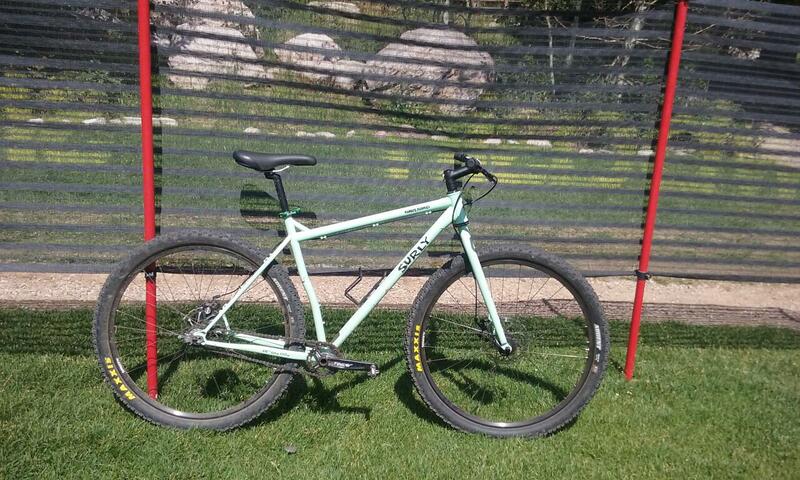 All sizes will come with 700C wheels, and the frame and fork provide enough clearance for up to a 29x2.0" tire! The stout steel frame feels like it will stand up to harsh roads you'd find anywhere. Even if you're not into long-distance touring, the bike would make a bomb-proof commuter! I've been trying to resist the Bluto suspension fork, but having now ridden a couple of bikes that have it, it may be an eventual addition to my 2014 Mukluk. 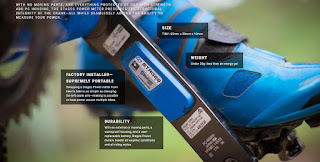 The updated geometry felt like it will work well for both aggressive trail riding and loaded expedition touring. The Salsa Beargrease is the racing-geometry fat bike in the line, and for 2016, it's also the most aggressively priced. 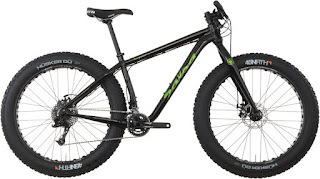 At $1,599.99, the 2016 Salsa Beargrease X5 features an all-aluminum frame and tubeless-ready SunRingle rims. The Warbird is Salsa's pure racing gravel bike, without any rack or fender mounts or any other bells and whistles. 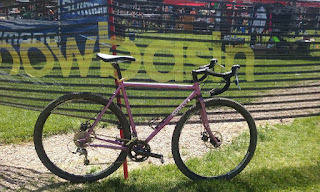 Many people consider gravel bikes to be slightly tweaked cyclocross bikes, but that description really doesn't do them justice. 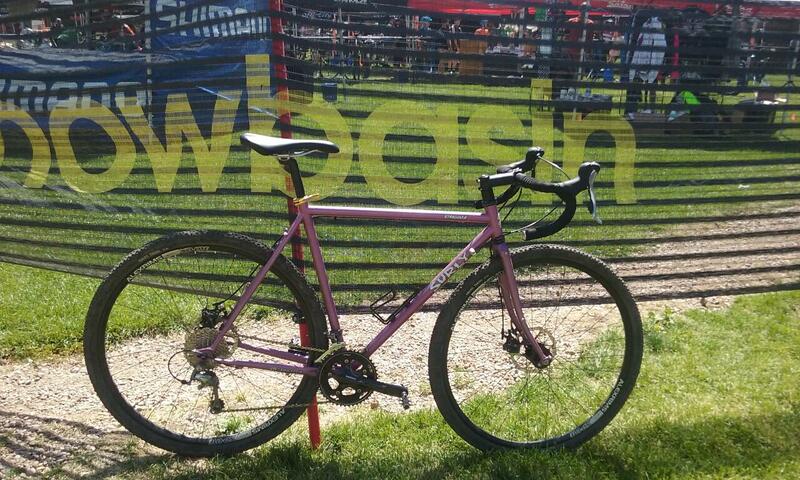 A cyclocross bike is designed to be ridden fast for at most an hour-long race. Gravel races, however, are often hours-long events of up to 200 miles, so the design is much different, with a geometry much more suited to helping you stay comfortable for long days in the saddle. If you haven't tried a gravel bike, you should check one out! 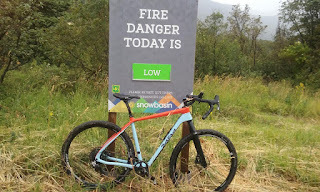 The all-steel Fargo features a SRAM X7 drive train (Green), the Fargo X9 has a steel frame and Salsa Firestarter carbon fork (Red), and the Fargo Suspension X9 has has the RockShox Reba RL 29 fork (Black). 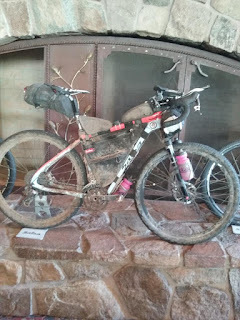 The sun came out on Tuesday, and the previous day's rain kept the dust down, making for perfect test-ride conditions. This day was Surly day for me, riding some old favorites, and old-but-new-to-me classics. 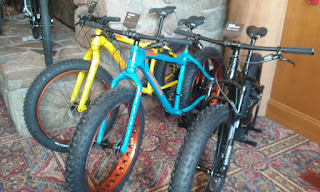 I had my first chance to ride an Ice Cream Truck, the 5-inch tire fat bike with trail-ripping geometry (as opposed to the more expedition-friendly geometry of the Moonlander). It rocks (sorry, no photo). 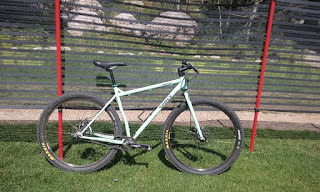 In a repeat of my 2013 visit, I rode the Instigator 2.0, the bike that introduced the world to the 26-plus tire size (don't worry; it'll work with 27.5 and 27.5-plus tires, too!). Still rippin' it since its introduction in 2013 is the Straggler, aka "disc brake Cross-Check:"
Surly did not have any brand new bike models to show off, but they tell me that they'll be introducing a new model soon, but not details will be released until the EuroBike trade show in late August. Based on some experiments I've seen on their blog, my guess (and this is COMPLETELY a guess) is that it'll be a fat-tire cargo bike, a Big Fat Dummy perhaps? 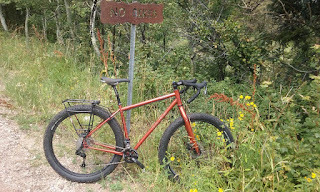 An often overlooked brand, another of Surly and Salsa's sister brands, is Cogburn, who make a fat bike targeted at the fin-fur-and-feather set (it's often shown with a gun rack mounted on the rear). The Cogburn CB4 fat bike comes in cool camo color schemes. 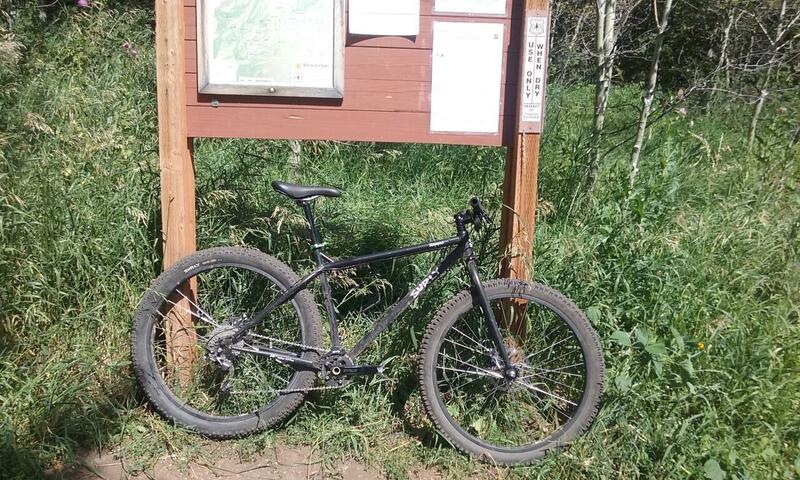 With only two sizes, a SM/MD and LG/XL, it's got a very upright geometry, making it feel like "your papa's fat bike." 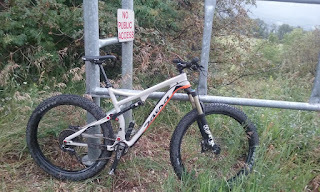 However, on my test-ride, I found it can still rip the trails with the best of them. So, you're asking, "what was your favorite?" As a Fargo owner, I was partial to the Deadwood. I felt the most confident riding the trail on the Pony Rustler. What can you expect to see in our stores? 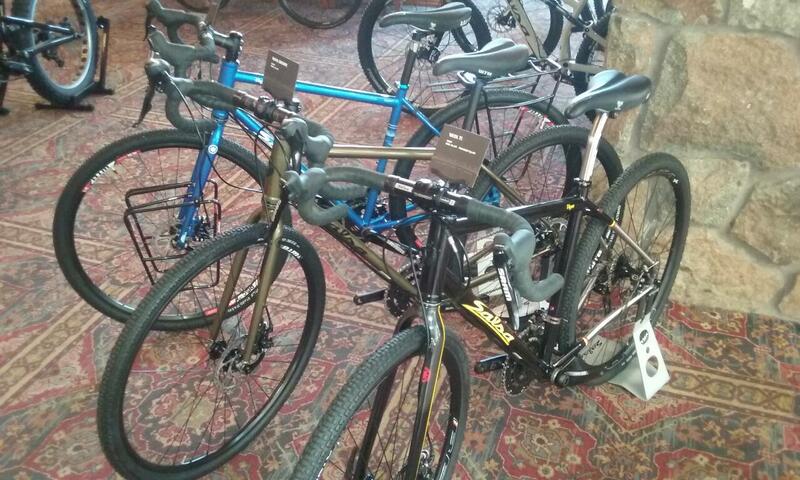 We'll continue to satisfy our bike-touring customers with the Marrakesh Drop-bar and the Vaya Deore. 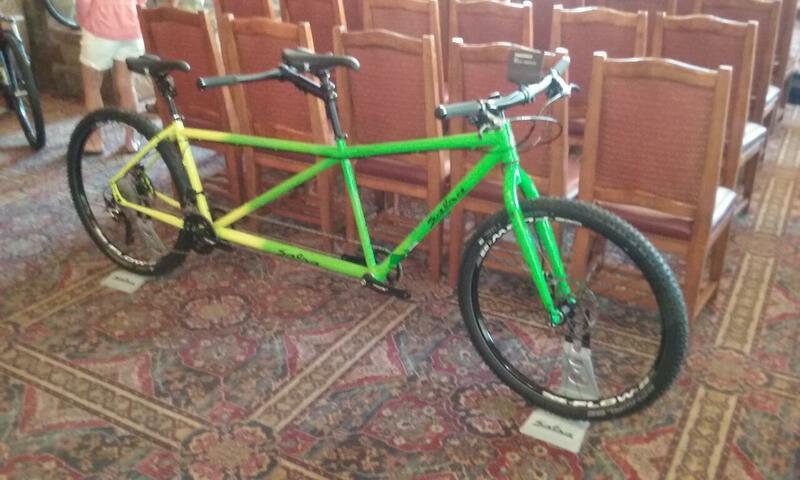 Look for the Beargrease X5 to be our bread-and-butter fat bike. We'll have a complement of Fargos, maybe a Cutthroat and a Beargrease Carbon, and may another Blackborow like this past year! Thanks to the 126 people who came to Peninsula for our latest Night Ride on the Towpath Trail this past Saturday, July 25! 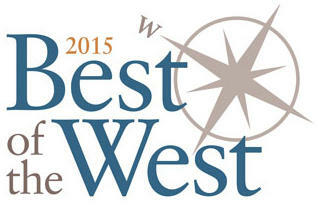 We are proud to announce that the Century Cycles store in Rocky River has been chosen as the "Best Bicycle Shop" in West Shore Magazine's "Best of the West" poll for 2015! This is an honor that we are proud to have won every year since 2009. Thank you to our loyal customers and our dedicated staff! Now available from Century Cycles, the Stages Cycling power measurement system used proprietary strain gauges laid precisely along your bicycle's left crank arm. Installing the system is as simple as swapping the left crank arm. With no external or moving parts, a waterproof housing, and a user-replaceable battery, Stages Power meters handle all weather conditions and all riding styles. The tiny size adds less than 20 grams, less than the weight of an energy gel. It's compatible with both Bluetooth and ANT+ sensors, so it's compatible with most existing bike computers that support power measurement, including Garmin and Wahoo Fitness power-compatible models, and with the Stages Power App (available for both Applie iOS and Android devices). If you're serious about training and serious about your power on the bike, stop into your nearest Century Cycles store and talk to us about Stages Cycling! Taking a ride to your favorite local brewery? Bring home 2 quarts of your favorite brew using the Salsa Anything Cage, Salsa Anything Cage HD, or Blackburn Outpost Cargo Cage and the Stanley 2-Quart Vacuum Stainless Steel Growler bottle! Thanks to Denise Zarrella from WOIO 19 Action News for coming out to our Rocky River store yesterday for a story comparing the customer service at local versus online retailers! Click here if the video above is not appearing for you, or to read the story online. 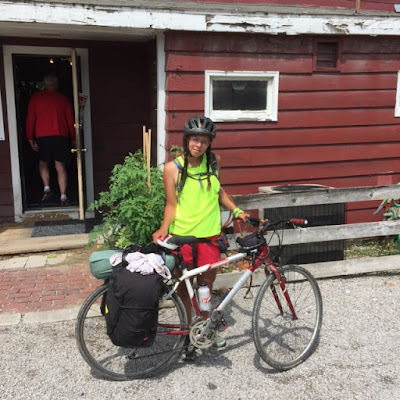 More bicycle touring visitors have been passing through our stores here in the Northeast Ohio area lately! Above is Rita, who is from Philadelphia, and stopped by the Peninsula store on July 10 during a ride around the Great Lakes. 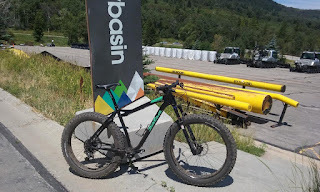 Rob Hatfield stopped by the Peninsula store to say Hi before catching a train to Banff, Alberta to ride his Salsa Fargo on the Great Divide Mountain Bike Route. What makes these folks able to head out on a long-distance bike tour, sometimes on their own? It starts with a desire, something on your bucket list. Another thing is overcoming your fears, and to help with that, the folks at Adventure Junkies put together a list of the 11 Fears Bicycle Tourists Face & How to Overcome Them. 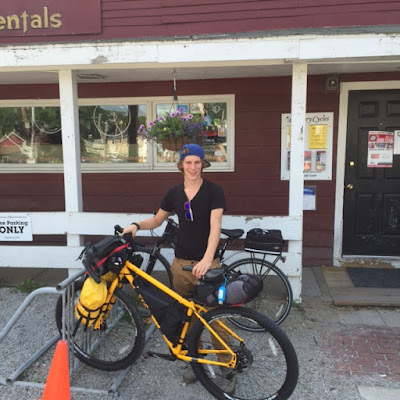 Thinking about a bike touring trip of your own? We've got experience long-distance touring experts in all three Century Cycles stores, so stop in and tell us what your dream is. We can help you select and order the right bike and touring equipment! Our stores are all located on routes of the Adventure Cycling Association Route Network. Our Medina and Peninsula stores are located on the Underground Railroad Bicycle Route, and our Rocky River store is located on the Northern Tier cross-country route. To see more photos of bicycle touring visitors who have visited all three of our stores, check out our Bicycle Touring Photo Gallery. 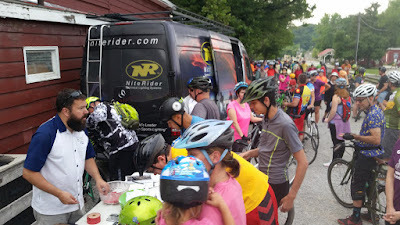 Thanks to the 161 rides who came to Peninsula to ride in our annual NiteRider Demo Night Ride on the Towpath Trail this past Saturday! 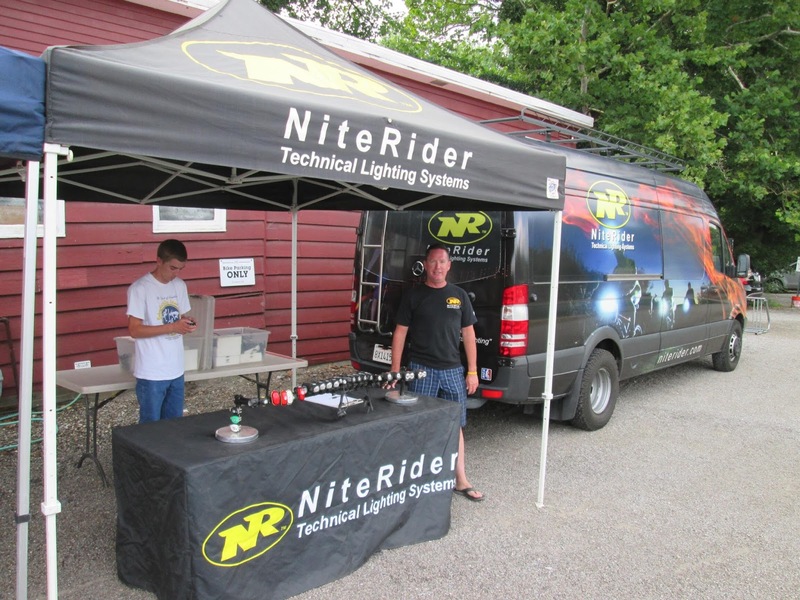 Thanks again to NiteRider Technical Lighting Systems for providing demo headlights, plus door prizes! IronCowboy Indiegogo from Jordan Maddocks on Vimeo. James Lawrence, the current Guinness World Record Holder for Most Ironman triathlons Completed in a Year, is taking on a 50-state Challenge this summer that he aptly calls the 50-50-50 Challenge. His purpose is to bring a national awareness to the ever-growing epidemic of childhood obesity, “We’re the first generation where the parents are slated to outlive their children,” The Iron Cowboy said, “The epidemic is so crazy that I had to do something that equaled its craziness in order for people to pay attention.” He’ll race 50 Ironman-distance triathlons in 50 consecutive days in 50 states to bring awareness and raise funds to fight this epidemic. Though racing this far seems impossible to most, James is prepared, “I know my limits were not reached in 2012 [when breaking the Ironman World Record] and I want to test the true limits of my mind and body with this 50-50-50 Challenge, and I want the people of the United States and around the world to join me,” said The Iron Cowboy. The 50-50-50 Challenge requires completing a 2.4-mile swim, a 112-mile a bike ride, and a 26.2-mile run every single day for 50 days in 50 different U.S. states. To save you the math, it’s a total of 120 miles swam, 5,600 biked, and 1,310 run over the course of the challenge. The public can join and participate, free, in their city’s challenge by registering at The Iron Cowboy’s website. The Iron Cowboy began his journey on June 6, 2015 and has been travelling state-to-state beginning in Hawaii, continuing to Alaska, and racing every day to finish in his home state of Utah on July 25. To see the route and schedule of where and when The Iron Cowboy challenge will take place check here. James will be here in Ohio on Monday, July 13, 2015 and basing his activities out of LifeCenter Plus (5133 Darrow Road, Hudson). His swim will start there at 6:00am, after which he'll jump on his bike and head down into the Cuyahoga Valley (it looks like he'll be doing several laps of our Valley Loop), and then head back up to Hudson to start the marathon run. At 7:00pm, the public is invited to join James for a 5K run. Go to www.ironcowboy.co/ic5k/ to register! Childhood obesity is exploding in America, with this generation being the first where parents are slated to outlive their children. As a father of 5, James believes it’s vital to reverse this trend and is using the publicity and profits he generates from the 50-50-50 in partnership with The Jamie Oliver Food Foundation to fight this epidemic. Thanks to generous donations from sponsors, James’ trip is funded, but he requires $100,000 in public donations for the documentary about this record-breaking victory. Award-winning director and cinematographer Jacob Schwarz, will produce the documentary. Donations are being accepted through The 50-50-50 Indiegogo campaign here. Donors will receive unique perks like one-of-a-kind art works, apparel, race bibs and copies of the documentary when completed. 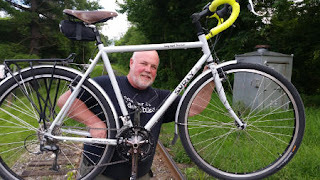 Hey, folks; it's that time of year again ... time for Tommy from NiteRider Technical Lighting Systems to bring the NiteRider Road Rig to Peninsula for our annual NiteRider Demo Night Ride on the Towpath Trail! Century Cycles is the first name in Night Rides, and NiteRider is the first name in high-end bicycle headlights. You can test out one of NiteRider's latest lights for FREE! The fun begins at 6:30pm, when we'll have the bike blender going to cycle-your-own smoothies! Arrive in plenty of time to find parking, sign in, and get yourself and your bike ready. The ride begins promptly at 8:00pm. 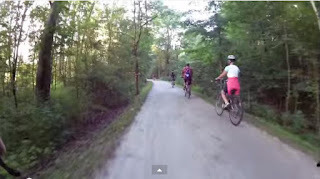 We'll ride our usual route on the Ohio & Erie Canal Towpath Trail south to the Botzum Trailhead and back, about 14 miles total. There is no cost for the ride, but you must have a photo ID and a major credit card to demo a NiteRider headlight. 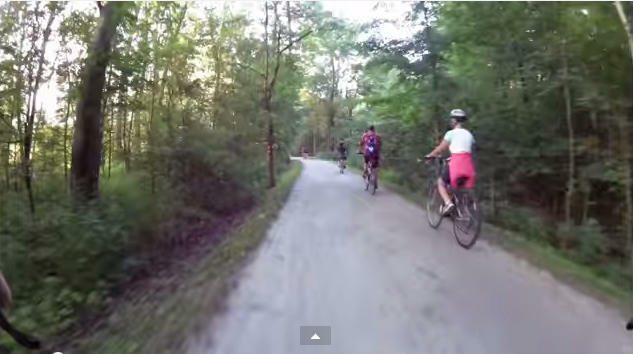 Century Cycles, in partnership with the Medina County Parks District, offer you a chance to meet for a casual, non-aggressive group bike ride of about 6 to 10 miles on the traffic-free dedicated bike paths in Medina County's local parks. The next Cycling Makes Sense Fitness Ride is tonight, Tuesday July 7, 2015. 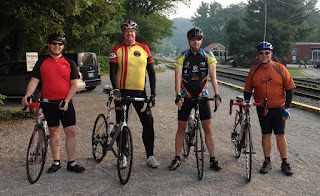 The ride starts at 6:30pm, and will be led by Lynne from the Century Cycles store in Medina. 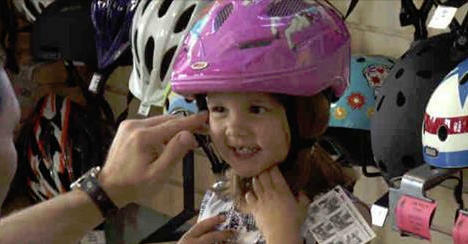 Lynne will start with a few tips on how to keep your bike and yourself pedaling in good shape. The location is the Lester Rail Trail, located at 3654 Lester Road in Medina. The ride is FREE and no pre-registration is required. Your own bicycle and a helmet are required. Adults only. 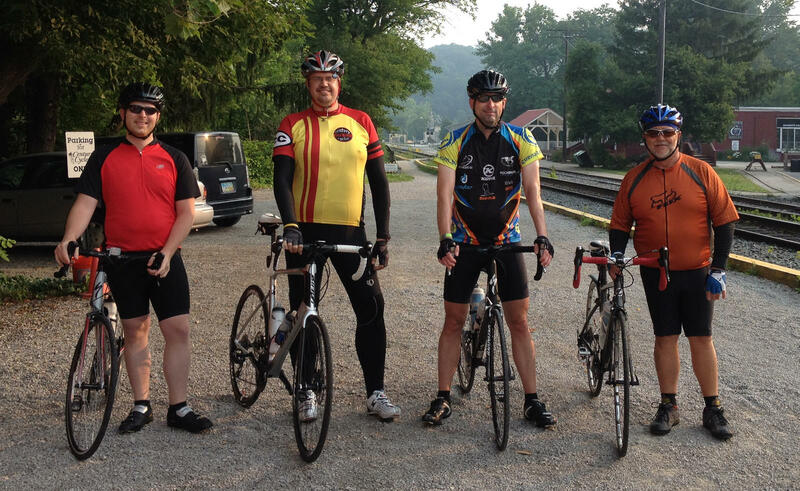 Thanks to the 5 cyclists who showed up for our Sunday Service Group Road Bike Ride in Peninsula yesterday! The group included Rich (second from left) and Doug (taking the photo) from the Peninsula store. The weather was beautiful, so was the low turnout due to post-July 4th celebration recovery? Hope to see you out on the road or trail! This past Friday, Canalway Partners announced the receipt of a $700,000 grant from the Ohio Department of Public Works through the Clean Ohio Greespace Conservation Program. 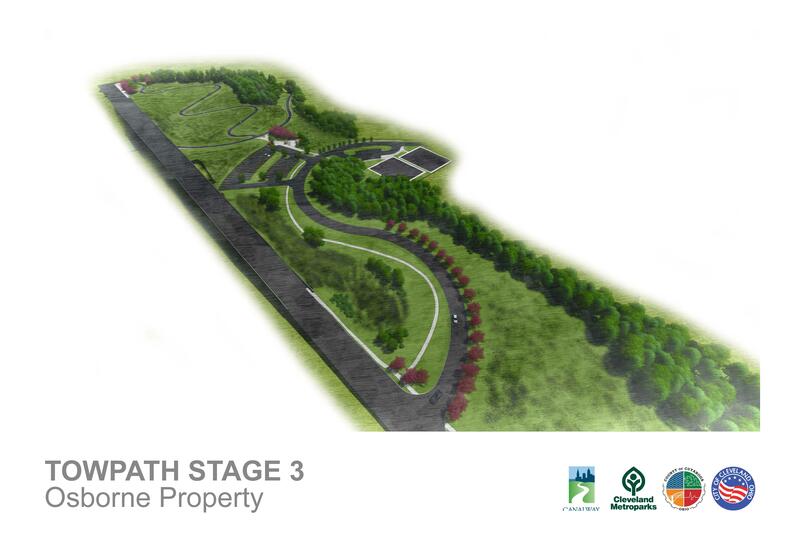 The funds will be used to acquire property for Stage 3 of the Towpath Trail Extension Project in the Tremont neighborhood of Cleveland.